Eat Less. Cut your calories. Watch your portion size. Those form the foundation of conventional weight loss advice over the last 50 years. And it’s been an utter disaster, perhaps only topped by the nuclear meltdown of Chernobyl. This advice is all based on a false understanding of what causes weight gain. Why don’t we ever consider the critical question of “What causes obesity?” We believe that we already know the full answer. It seems so obvious, doesn’t it? We think that excessive intake of calories causes obesity. We think that this is a caloric imbalance. Too many ‘calories in’ compared to too few ‘calories out’ leads to weight gain. This Calorie Balance model of obesity has been drilled into us since childhood. The underlying, unspoken premise is that these are independent variables fully under conscious control. This completely ignores the multiple overlapping hormonal systems that signal hunger and satiety. This further assumes that basal metabolism remains stable and unchanging. But these assumptions are known to be incorrect. Basal metabolic rate can adjust up or down by forty percent. Restriction of calories invariably leads to a reduction in metabolism, ultimately defeating weight loss efforts. For the last 50 years, we have unquestioningly followed this ‘Caloric Reduction as Primary’ program. Dietary fat, being high in calories were restricted. We made food guides, food pyramids, and food plates to indoctrinate children into this brand new low-calorie religion. ‘Cut your calories’ was hymn of the day. “Eat Less, Move More!” we chanted. Nutrition labels were mandated to include calorie counts. Programs and apps were created to more precisely count calories. We invented small appliances like Fitbits to measure exactly how many calories we were burning. Using all of the ingenuity that makes us human, focused like a laser beam, and dogged as a turtle crossing a road, we cut calories. What was the result? Did the problem of obesity simply fade away like the morning mist on a hot summer day? The results could hardly have been worse if we had tried. The storm of obesity and type 2 diabetes started in the late 1970’s and today, some forty years later, it has become a global Category 5 hurricane, threatening to engulf the entire world. Only two possibilities can explain how obesity could spread so rapidly in the face of this shiny new advice to reduce fat and calories. Perhaps the ‘Caloric Reduction as Primary’ advice is simply wrong. The second possibility is that this advice was good, but people simply were not following it. The spirit was willing but the flesh was weak. This is the game called, “Blame the Victim”. This shifts the blame from the advice giver (the advice is bad) to the advice taker (the advice is good, but you are not following it). Was the entire obesity epidemic simply a sudden, simultaneous, coordinated, worldwide lack of willpower? The world can barely agree upon which side of the road we should drive, but yet, without discussion we all decided to eat more and move less? By declaring that their scientifically unproven caloric reduction advice was flawless, doctors and nutritionists could conveniently shift the blame from themselves to you. It wasn’t their fault. It was yours. No wonder they loved this game so much! To admit that all their precious theories of obesity were simply incorrect was too psychologically difficult. Yet evidence continued to accumulate that this new caloric restriction strategy was about as useful as comb to a bald man. The Women’s Health Initiative was the most ambitious, important weight loss study ever done. 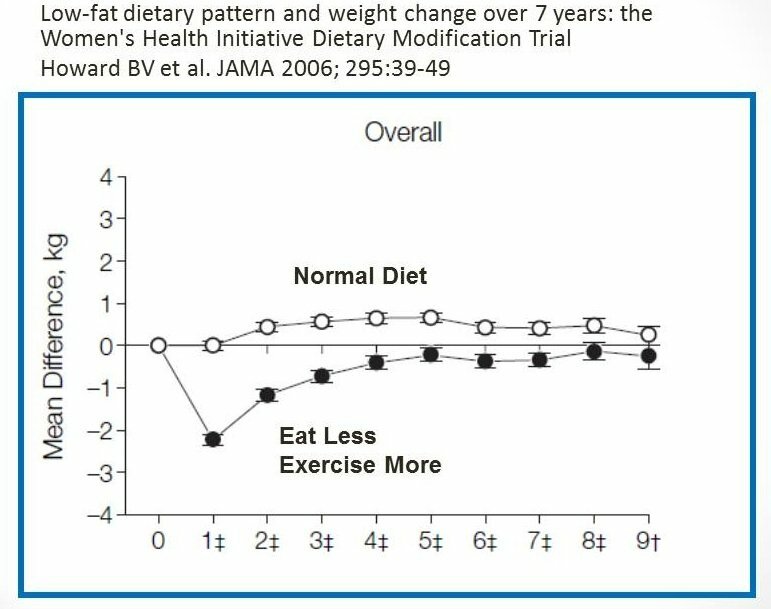 This enormous randomized trial involving almost 50,000 women evaluated this low-fat, low calorie approach to weight loss. Through intensive counseling, women were persuaded to reduce daily caloric intake by 342 calories and increase exercise by 10%. Calorie counters expected a weight loss of 32 pounds over a single year. This trial was expected to validate conventional nutritional advice. But when the final results were tallied in 1997, there was only crushing disappointment. Despite good compliance, over 7 years of calorie counting led to virtually no weight loss. Not even a single pound. This study was a stunning and severe rebuke to the Caloric theory of obesity. Reducing calories did not lead to weight loss. So, there were now two choices. First, we could respect the expensive, hard-won scientific evidence to devise a most robust, more correct theory of obesity. Or, we could simply keep all our convenient, preconceived notions and ignore the science. The second choice involved far less work and far less imagination. So, this groundbreaking study has largely been ignored and relegated to the dustbins of nutritional history. We have been paying the pied piper every since, as the twin epidemics of obesity and type 2 diabetes explode. Real world studies only served to confirm this stunning fiasco. Conventional dietary treatment of obesity carries an estimated 99.4% failure rate. For morbid obesity, the failure rate is 99.9%. These statistics would not surprise anybody in the diet industry, or even, for that matter, anybody who has ever tried to lose weight. The Calories In, Calories Out theory had gained widespread acceptance based on its seemingly intuitive truth. However, like a rotting melon, digging past the outer shell reveals the putrid interior. This simplistic formula is riddled with erroneous assumptions. The most important source of error is that reducing ‘Calories In’ leads to a reduction in metabolic rate, or ‘Calories Out’. A 30% reduction in calorie intake is quickly met with a decrease in basal metabolic rate of 30%. The net result is that no weight is lost. The other major false assumption is that weight is consciously regulated. But no system in our body is wholly unregulated like that. The thyroid, parathyroid, sympathetic, parasympathetic, respiratory, circulatory, hepatic, renal, gastrointestinal and adrenal systems are all closely controlled by hormones. Body weight and body fat are also strictly regulated. In fact, our bodies contain multiple overlapping systems of body weight control. Body fat, one of the most important determinants of survival in the wild, is not simply left to the vagaries of what we decide to put in our mouths. Hormones control hunger, telling our body when to eat and when to stop. Ghrelin is a powerful hormone that causes hunger, and cholecystikinin and peptide YY are hormonal satiety signals, which tell us that we are full and should stop eating. Think about the last time you were at the all-you-can-eat buffet. Imagine that you’ve already eaten many heaping platefuls of food, and you are completely, 110% full. Now, could you eat a few more pork chops? Merely the thought might make you nauseous. Satiety hormones are exerting a powerful effect to stop you from eating. Contrary to many popular beliefs, we do not simply continue eating simply because food is available. Calorie consumption is under tight hormonal control. 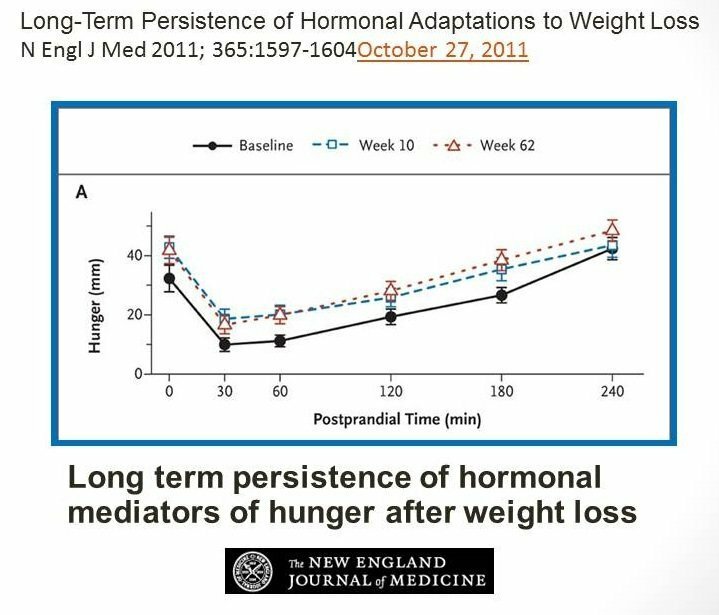 Studies show that weight loss leads to persistent elevations in ghrelin which leads to increased hunger even 1 year after weight loss. It was simply the loss of willpower, these patients were actually, physically, measurable hungrier. Hormones also regulate our basal metabolic rate, the baseline level of energy needed to keep our bodies running normally. This is the energy used to generate body heat, to power our heart muscles, our lungs, our liver, our kidneys, etc. Low caloric intake reduces basal metabolic rates as much as 40% in an effort to conserve energy. Deliberate over-feeding increases basal metabolic rates as the body tries to ‘burn’ off the excess energy. Fat accumulation is really not a problem of energy excess. It’s a problem of energy distribution. Too much energy is diverted to fat production as opposed to, say, increasing, body-heat production. This energy expenditure is controlled hormonally. For example, we cannot decide how much energy to expend on fat accumulation versus new bone formation. Therefore, what is important is how to control the hormonal signals we receive from food, not the total number of calories we eat..
As long as we believed, wrongly, that excessive caloric intake led to obesity, we were doomed to failure. Under this paradigm, 500 calories of brownies is just as fattening as 500 calories of kale salad, a notion that is clearly ridiculous. Blaming the victim turned obesity from a hormonal disorder into a moral failure and excused medical professionals from their botched attempts to treat the obesity epidemic. We could not ‘decide’ to be less hungry. We could not ‘decide’ to increase basal metabolic rate. If ate less calories, our body simply compensated by decreasing metabolic rate. Different foods evoke different hormonal responses. Some foods were more fattening than others. Calories were not the underlying cause of weight gain. Therefore, reducing calories could not reliably reduce weight. Obesity is a hormonal, not a caloric imbalance. The hormonal problem was mainly insulin. We made food guides, food pyramids, and food plates to indoctrinate children into this brand new low-calorie religion. I’m currently picturing a black pyramid with a ring of children dancing around it, offering plates of the “preferred foods” (the ones pictured on the pyramid) and chanting as they go around and around it–this may be a good opening to some sort of nutritional horror movie. If only Hitchcock were still alive!! So how come some people can just count calories and eat at a deficient and lose weight while others can’t? Though some people will weigh and count every little thing and that’s just plain ridiculous. We didn’t’ evolve with calorie tracking apps and weight scales. Maybe some people are just fat because of traditional reasons. They then lose weight and start blabbering if I can do it anyone can. People with real hormonal issues aren’t going to be part of the successful 1%. Note almost every story of big weight losses starts with out of control gluttony even exceeding CICO predictions. These folks within the community you spoke may be poor– but remember Dr Fung debunks the excuses and says everyone can fast. No money? You can still fast. Can’t cook? You can still fast. I doubt Dr Fung would mind if I add; No healthy food available? You can still fast. Studies have found that for people without insulin resistance, many types of diets are effective. For those with insulin resistance, it’s the low carb-high fat approaches which are effective. One factor among several is that reducing calories will also tend to reduce some of what is hormonally problematic, at least for the short term. For example, if a dieter opts to switch from soda to water as a calorie reduction method, they are also causing a sugar reduction. Hi David. What fasting protocol are you following? Awesome. 100 pounds in 10 months. What type of fasting? Thanks David. I read your blog and found it really inspiring. I agree that it can be very socially awkward to do longer fasts, and there is even a lot of pressure from my family to not do them. My personal record is 96 hours, but I hope to do even longer fasts to reap more of the rewards. Out of curiosity, do you have any restrictions on the type of foods you eat when not fasting? The other rule I follow is I eat things that might be bad but I run in through a badness yumminess tradeoff filter. So no cadbury bars only godiva. Not only that, they said that a relatively small caloric deficit (like 500 kcal/day) would *prevent* metabolic slowdown. What are they saying now, or are they just denying? Pseudoskeptical denial based on “flaws” in the study. CICO still works. You just have to eat even less and it’s your own fault you got fat in the first place so you need to suffer and accept the consequences of your past bad behavior. We knew this all along. Why should we spend money trying to fix this problem. Do you have the links to the studies with metabolism and fasting? Fung has so many blog posts it’s hard to find the right one. doing HIIT decreases my appetite. seems counterintuitive. what’s the mechanism here? The decrease is due to the body’s fight or flight reponse shutting down digestion in order to cope with the extreme exertion. Karen .. men and women behave differently to HIIT .. as a general rule ..
You fall into the general rule. Women obtain a hunger supression effect .. generally. Men just the opposite .. again as a general rule. Because I am carrying around 10% body fat .. I don’t follow the general rule. When I am very lean .. I do follow the general rule. In fact to avoid that I strictly follow the “lean gains” 16 hour fatsing and 8 hour feeding protocol. In previous post Dr. Fung points out that basal metabolic rate is not decreased when a person fasts INTERMITTENTLY. The 40% drop in BMR occurs only over long periods of caloric restriction, as the graph demonstrates, representing the body’s attempt to maintain its original set point. in extended fasting the calorie restriction doesn’t seem to occur. See Dr. Fung talking about the mad scottsman. The bmr reduction occurs with calorie restriction. Fasting is different. This also accord with my experience. “the hormonal problem was mainly insulin” So what about the recent studies demonstrating the herb Berberine is as effective as Metformin without the side effects? And when synergized with d-limonene provides, in addition to blood sugar reduction, other health benefits. For all you know this herb affects insulin or the satiety hormones. I have read berberine is hard on microbiome and a break from it is required along with taking a probiotic, regularly. I have taken in for limited time and have read it is a substitute for metformin, but why take anything if intermediate fasting and LCHF diet can retrain body to not be insulin resistant? This makes a lot of sense. I used to be overweight and after loosing the weight my body is extremely sensitive to gain again. I have been on a LCHF regimen for a while but not very successful in loosing the last 15 pounds of extra visceral fat. I know is due to a hormonal imbalance and a decrease basal metabolic rate. I recently incorporated fasting into my routine with the purpose of helping my system to balance the hormones. What do I need to do to increase my basal metabolic rate? Eat monounsaturated and saturated fasts, and consider heavy weight training and HIIT. Richard, have you read Dr Fung’s new book on Fasting? One question I’ve had for some time is the blurring of LC and VLC. In the Complete Guide to Fasting, it feels like he uses them interchangeably. Perhaps part of the problem is I did Atkins several times in the past and Atkins tends to equate carbs < 10gr/day to be the way to maintain ketogenesis. I've been trying to keep mine, < 30% of calories. I find it ever so confusing. Any thoughts? Walt, that seems to be mixing up the amount of calories with the type of calories. Low calories and very low calorie diets can’t work long term. A low carbohydrate way of eat can and does work, but anywhere near 30% carbohydrates wouldn’t be thought by most people to be low carb, although it’s certainly a lot better than the standard diet. I’d say I’m more in the 5% – 10% carb range and it means I’m rarely hungry and sometimes go into ketosis, but it’s not something I concern myself about. Dr. Fung, is it possible to increase one’s basal metabolic rate after decades of yo yo dieting? Would a combination of LCHF and Fasting be sufficient or are there other methodologies that need to be applied (such as excercise) to increase BMR? From the recent research (because I wondered the question to myself) .. (short answer) no. Perhaps a controversial “Biggest Loser” show is on order. Why not have a CICO vs. LCHF season. Controversy sells. The sheer scandal of the contestant “breaking all the rules” would draw in millions of viewers. I would love to see Dr Fung coaching someone through to not only lose weight–but possibly lose/reduce some medications. I am envisioning the CICO contestants with crazy non-stop exercise and the LCHF taking wonderfully, relaxing moderate hikes in the woods. Thank you Richard, Stephen and Andy for your input– I guess I’ll have to wait and see what my body does. IF paired with LCHF really fits my lifestyle–I think I’ll keep things as is until/unless I develop health issues. Thanks again–I am very new to all of this–but it feels like the permanent answer I am looking for. It’ s amazing the differing comments and opinions in this comment thread, considering we must all follow Jason Fung or be searching for similar stuff. I think if I showed this article to a cross section of my work colleagues, they would just be like “what is this crap” and wouldn’t even ponder it or do there own reseach into it. Sad really. I have been keto for 10 months and loving it. Thanks für the reply Stephen T, but anyway I´m still interesting in that question… So if we get forced to eat like a goose that they get a fatty liver to make patee out of it… What happened, do we get fat, too?